1) Combine 300 grams filtered water, 150 grams white flour, and 150 grams whole-wheat flour together in a small, clear plastic container, and mix until smooth. I encourage you to use unbleached, unbromated white flour with a protein level of at least 11%. King Arthur Bread Flour meets these guidelines and is available at most grocery stores. 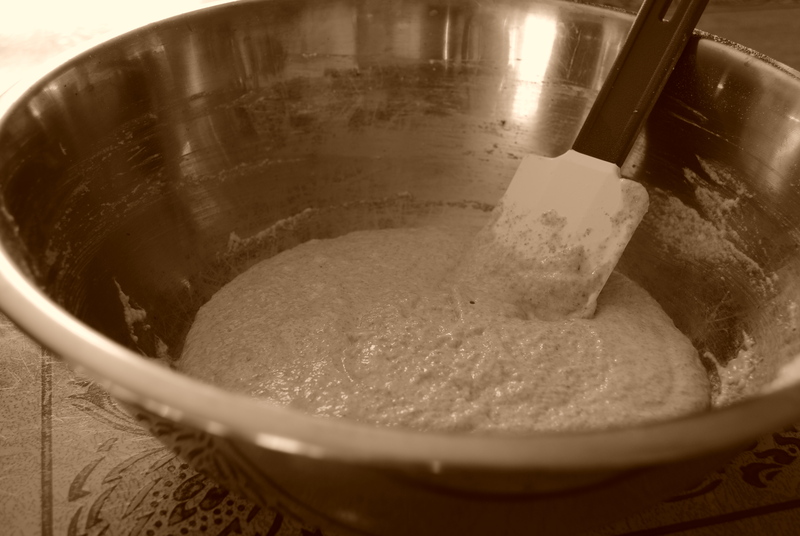 The mixture will look like pancake batter, without the lumps. Cover loosely with a lid or kitchen towel and leave out for 24 hours at room temperature. 2) Check the culture. Not much activity should have appeared, if any. Pour in another 300 grams of filtered water, 150 grams white flour, and 150 grams of whole-wheat flour. Mix until smooth; cover loosely and leave out for another 24 hours. 3) Check the culture. There may be signs of activity at this point. Visually, the culture will have expanded to double, perhaps triple in size. There will also be small bubbles on the surface. The aroma will be strong, fruity, and musty in this initial stage. If the culture does not show these signs, give it a stir and measure out 300 grams in a small bowl and discard the rest. Add 150 grams filtered water, 75 grams white flour, and 75 grams whole-wheat flour. Stir to a smooth paste and return to the plastic container. Cover loosely and leave out for 24 hours. 4) By this time, your culture should show signs of activity as described in step 3. If not, continue feeding by measuring out 300 grams and adding 150 grams water, 75 grams white flour, and 75 grams whole-wheat flour. Continue to do this daily, until you see signs of activity. 1. The culture will have expanded, causing it to rise and become frothy. Once its energy is expelled, the culture will collapse, leaving a residue on the sides of the container. There will also be small bubbles on the surface. 2. The aroma will change from strong and musty to bright and fruity, with a hint of tanginess. 3. If you stir the culture, you will notice webbing or stands form. 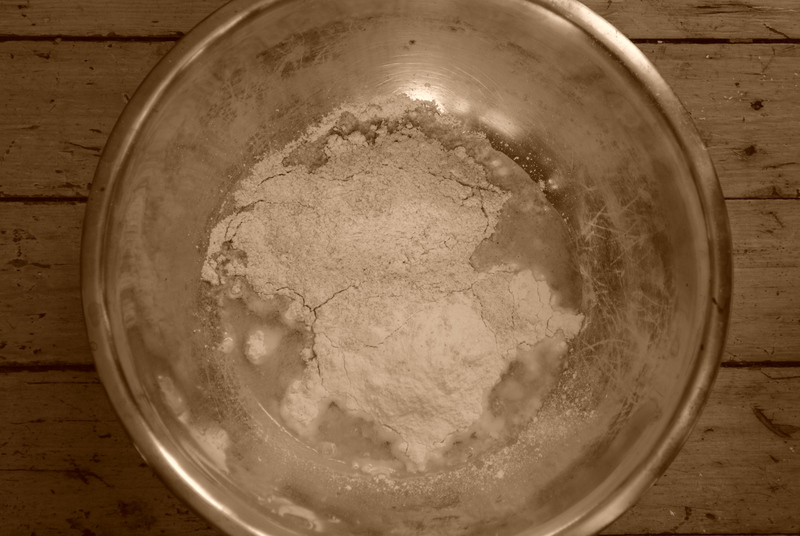 This is a sign of the gluten development that is crucial to the structure and strength of the dough. Typically, this cycle can be observed in 8-12 hours or overnight. If your culture does not exhibit these traits in a predictable manner, continue feeding, by measuring out 300 grams culture, 150 grams filtered water, 75 grams white flour, and 75 grams whole-wheat flour and mixing, until it does. If, after 6-7 days of feeding your culture, it does not show signs of activity or does not rise and fall as described, you will need to discard it and start over. Do not be discouraged. There are many factors influencing this fragile environment. If still, after several attempts of activating a culture, you are unsuccessful, there are paths you can take. One is to use a an already active starter. If you live near a bakery that makes sourdough bread, ask them if you can have a small piece of their starter. To build this culture, just weigh it in grams. Whatever the weight is, add half that sum of filtered water and the other half 50% white flour and 50% whole-wheat flour. For example, if the starter weighs 200 grams, you would add 100 grams of water and 50 grams white flour and 50 grams whole-wheat flour. Mix until smooth and set out overnight. If it rises and collapses, it is ready to make bread with. The second option is to order an already active starter. King Arthur Flour offers a starter that has been in use for over 100 years. Either way, the goal is the same – a healthy culture that will consistently leaven bread. Once you have built your culture, you can either start using it to leaven bread, or store it in the refrigerator. It will need to be fed once a week to remain active. The breads I will be sharing need 300 grams of culture to refresh and 220 grams to build the leaven. I recommend keeping 600 grams of starter at the ready. 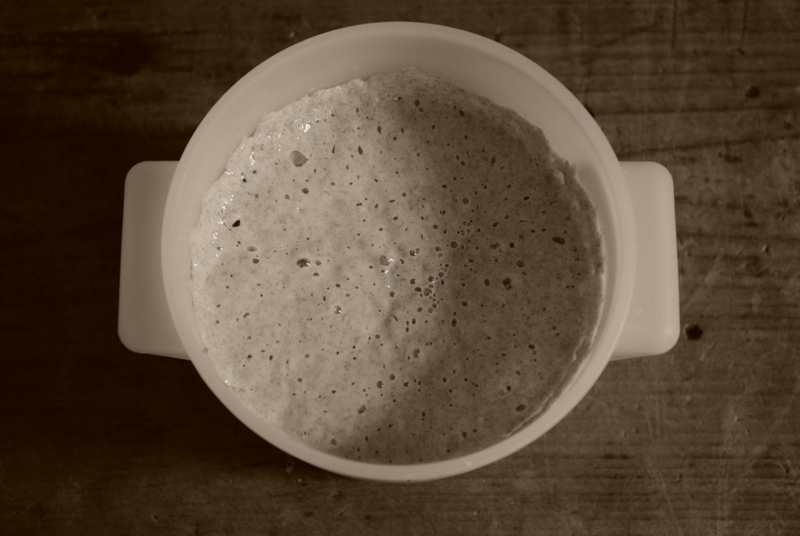 The steps in this page should help you to produce a thriving, mature sourdough culture. If you have any questions or need some clarification on any of the steps, please leave me a comment. Thanks for sharing in great detail. I can’t wait to start my own. Thanks Chris. If you can’t get it going, let me know and I’ll give you some of mine. Thank you for your wonderful article. I have a sourdough culture that is doing pretty well, but it seems to prefer whole wheat flour to all-purpose (it rises much better with whole wheat). Is there something I can do to use this culture in white breads? I suggest a sourdough culture with equal parts whole-wheat and white flour. Whole-wheat flour has more starch in it, resulting in more fermentable sugars (food for the microrganisms in your starter). This means a more active culture (a better rise) because there is more food. You can use this culture in any white breads. The whole-wheat won’t transfer a heavy taste but rather a more complex flavor. I hope this answers your question. Thank you, I believe that does answer my question. I realize this is an old thread, but is there a problem with making cultures out of 100% whole grain flour? For example making the starter with all whole wheat flour or rye? Also, I am starting to mill my own flour, I’ve heard conflicting advice regarding aging fresh milled flour. Would that matter for a starter? As far as using all whole-wheat or rye flour in a sourdough culture, this is fine. Both flours are higher in nutrients and fermentable sugars than white flour. This means there is more food for the microorganisms to eat, resulting in a strong and healthy sourdough culture. I don’t know much about fresh milled flour and its effects on a sourdough starter. I worked at a bakery where we milled our own whole-wheat flour. It was only used in small amounts in our sourdough, but it didn’t seem to have any adverse effects on the bread. I would say try it. I’m sure the finished bread will be a lot more nutritious and tasty than any store bought flour. I hope I’ve answered your questions. Let me know if you need help with anything else. Thank you so much for the information. That’s very helpful.